Download the appropriate JRE for your application server from the Oracle web site here. Be sure to choose, download and install the JRE and NOT Server JRE. Download the JRE specific to the operating system on the computer where you will install FootPrints Service Core. An Oracle account and login may be needed before being permitted to download the JRE. Run the JRE installer downloaded from the Oracle website to install the JRE. 5. Install Tomcat 7.0. When installing to an existing Tomcat server the installer will not modify the configuration of the Tomcat server and the server administrator will need to modify the configuration manually. The steps below need to be performed prior to installing FootPrints Service Core 12. Run the Tomcat installer on the system where FootPrints Service Core will be installed. For additional help installing Tomcat 7, please review the documentation on the Apache Tomcat web site. 6. (This is for a Windows Server OS installation). The first 3 items should be done prior to installing of Footprints. Start the Tomcat Service Wrapper (Tomcat7w.exe). Refer to the image below when making changes in the Tomcat Service Wrapper. For configuring Tomcat for version 12.1.01 and later ONLY: In the Java Virtual Machine field, use the ellipses button (…) to navigate to the folder where Java 8 is installed and select the jvm.dll file. See the first screenshot below with the Blue border. In the Initial memory pool box, enter a value of 2048. In the Maximum memory pool box, enter a value of 8192. NOTE: When setting the Maximum memory pool (-Xmx) value, ensure there is enough physical RAM on the server to accommodate this setting as ALL available memory of the server will be used for the Maximum memory pool setting. Therefore, a server should have 10-12GB of RAM as a minimum if a Maximum memory pool setting of 8192 is to be used. And this SHOULD be used. Click “OK” to save your changes and close the dialog. Open the Services module on the Windows server. 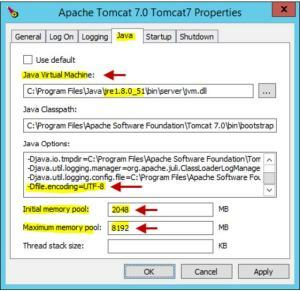 Change the “Startup Type” of the “Apache Tomcat 7.0 Tomcat7” service from “Manual” to “Automatic”. Restart Tomcat. As mentioned above, if upgrading FootPrints, be sure it is stopped again before proceeding with the upgrade.